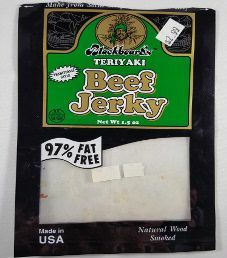 The next review on Blackbeard’s will focus on a 2.5 ounce/70 gram bag of their teriyaki beef jerky. 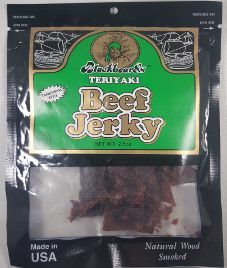 This flavor is described as a delicious blend of brown sugar and soy sauce added to premium, tender beef to create an outstanding mild, and very popular beef jerky. 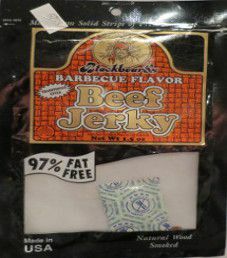 The bag was purchased at a gas bar convenience store in New Milford, Pennsylvania. 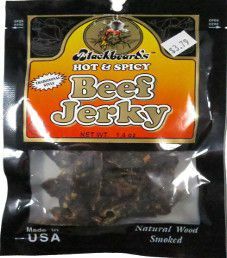 The next review on Blackbeard’s will be on a 1.4 ounce/40 gram bag of their hot & spicy beef jerky. This bag was purchased at a convenience store in late December 2014, while visiting East Rutherford, New Jersey.